Although there are many other apps that let you download videos from YouTube, there is nothing out there that can compete with SnapTube. It’s free, there are no ads, and you can use SnapTube to download YouTube videos without any limitations. When you download SnapTube, you enjoy all the premium features without having to pay anything. This luxury isn’t the case with other apps as they either charge a premium fee for advanced features or simply kill your mood with annoying ads and pop-ups. This is the ULTIMATE tutorial and the only one you’d ever need! 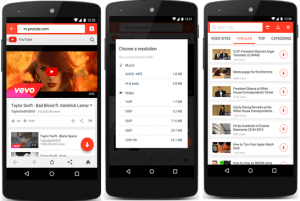 There is a simple method to install this killer video downloading app on your device. Follow the instructions below. First, download SnapTube apk from this link. For Android Users: If you are an Android user, you will easily install this .apk on your phone. Here is how to do it. Move the downloaded apk file to your phone via file manager. Enable ‘installation from unknown sources’ by going to Settings>Security. Run the app from app-drawer. For Windows PC users: If you are a Windows PC user, you need to download an emulator for Android so that you can run a virtual Android device on a computer. Here is how to do it. Install Bluestacks on the PC by downloading it from this link. Run downloaded .apk using Bluestacks. Just double-click the file to run it in Bluestacks. If that doesn’t work, right-click on the file and select ‘Open with Bluestacks’. Run the application by clicking its icon from Bluestacks virtual Android device. For iOS users: SnapTube isn’t available for iOS but you may install it on a MAC computer using the method mentioned above. The only difference is that you will download Bluestacks for MAC instead of PC. Unfortunately, there is no way to run this app on an iPhone. Bookmark this page for updates or subscribe to our newsletter to have the news delivered straight to your email as soon as there is a version for iPhone. How to use SnapTube to Download YouTube videos? So now you have downloaded the SnapTube application on a laptop/phone and you want to know how to use it. There is nothing complicated about it. Keep reading to learn how to use SnapTube to download YouTube videos instantly. Step 1: Run the app on phone or laptop. If you installed it on a computer, you need to start the emulator and only then you can run this app. Step 2: When the app loads, you will see a homepage with latest videos. Pick a video and touch it to start playing it. Step 3: You may search for videos using the search feature in SnapTube. Find your favorite video using search and click Play to start watching it. Step 4: To download a video instead of watching it, click the ‘down arrow’ button on the right top corner. This should bring up the download menu where you download the video. Step 5: Before you use SnapTube to download YouTube video, you choose video format, resolution, and quality. You can also choose to download MP3 audio file instead of audio/video file. That’s it, guys. Now you can use SnapTube to download YouTube videos on mobile, PC, and laptop with just two clicks.